The Searcher Waterproof 10 is a 10-inch tall men's boot that's constructed for various terrain. 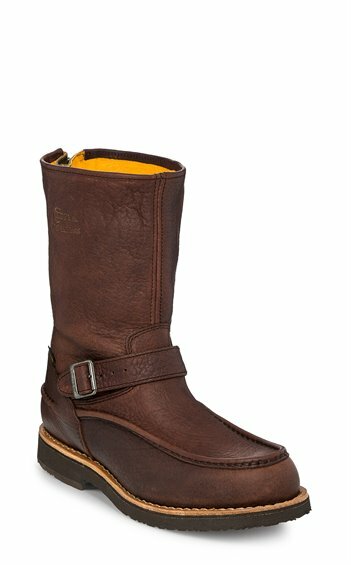 The mahogany leather exterior is rugged and durable and features a back zipper for easy access in and out of the boot. The Chip-A-Tex® waterproof membrane system blocks water while still allowing for freedom of movement and the seam seal construction provides added moisture protection. The mocc toe and shark skin tip are unique qualities that set this boot apart and the Bontex® insoles guarantee lasting comfort and support. The steel shank helps give stability and the Vibram® outsole guarantees traction and grip on wet and dry surfaces so this boot can go anywhere. I wear my pants in my boots the zipper makes a clink clink noise if you wear them this way...good motorcycle boots.. and snow boots.. These boots are like walking on a cloud! I didn't expect anything different from Chippewa! I have bought two pairs of these boots in the last year or so, only because my father wanted a pair so I gave him the first pair that I only had for a few weeks. I have four pairs of Chippewa boots, two being snake boots. They are built to last. My only concern is the heel cup on this last pair. Why the change? It feels as if without the use of a shoe horn it will be pulled under the foot. I never had this issue with the first pair. Only time will tell. In my case they run a half size large (but I do like them snug for wear in the woods / mud and to allow for stretching). They can be found less expensive and with quicker shipping through distributors (so much for cutting out the middle man I guess). All in all, I think they will prove to last with maybe a sole replacement and some work on the heel cup in the future. I LOVE my moc toe bison waterproof boots. I ride motorcycles about 20,000 miles a year and these comfortable and uniquely styled boots are my "Go To" boots. I have 2 other pair of motorcycle boots that are sitting in the closet jealous of the chippy's that get to see journeys pass by them! I use these for chores and running errands. These are the boots that will make you think..." I better buy another pair in case they quit making them" but they are so tough that I am not sure I can wear them out! They age beautifully. I own a couple pairs of Chippewa boots and love them! Quality is superb and they are uniquely stylish enough to wear as dress boots or in the woods. These are boots that last a long time, they are comfortable to wear and stand up to the toughest conditions!!! I have owned boots all my 60 years and nothing ever felt so good on my feet! !